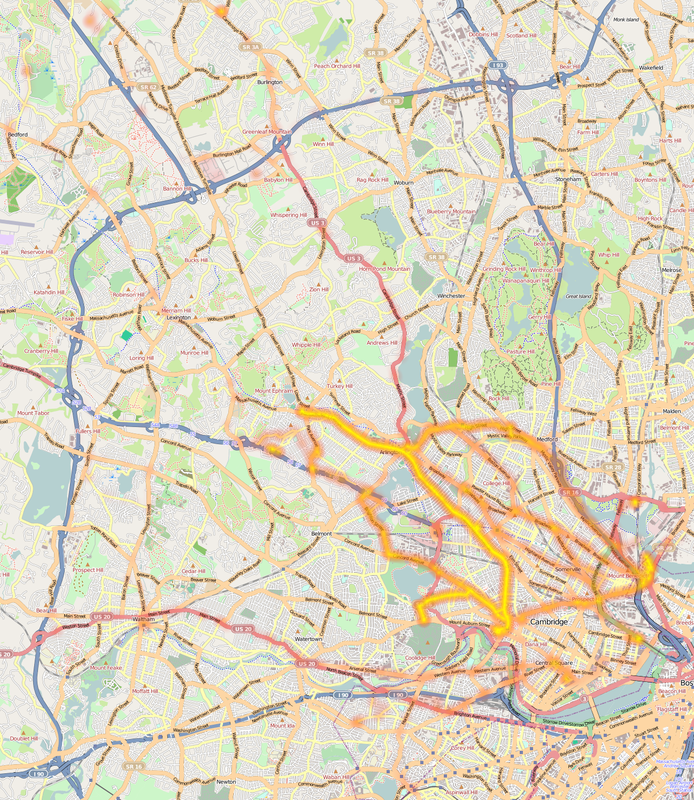 In 2010, the MBTA added GPS devices to their buses, and made the data available in real time. I collected and stored a lot of this data, with plans to make some sort of useful app. That never happened, but it was good excuse to make some simple visualizations. I took a day’s worth (June 15th, 2010) of the data and used the canvas API to draw it with varying styles. I’ve saved a couple of videos in case it ever stops working. A full week of the data I started with is saved at http://static.ryanberdeen.com/projects/bus/data/vehicleLocations.csv (150 MB). I’m not sure about the data quality. I made a heatmap of the position of the 77, and it seems to spend a lot of time off its route.